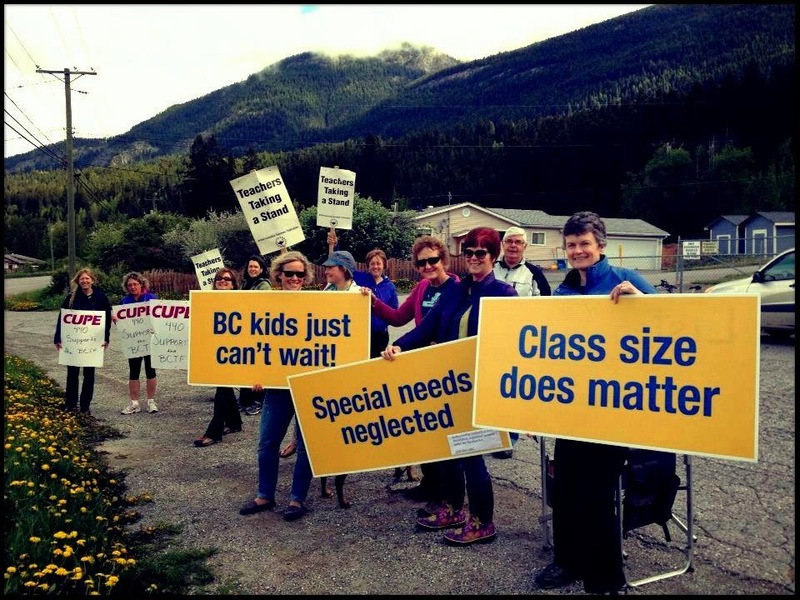 I find myself getting riled every year about this time, because it is usually this time of year when our Provincial Government has driven the local teachers' union to the end of it's rope by provoking strike action so the government can legislate an agreement that further erodes the education system in our province. I have seen my former profession changed so radically over the years, due to misguided, even malicious campaigns by the government, intended to break the union and, I suspect, undermine public education so it can be privatized! It's certainly not the same job it was when I started as a teacher back in the seventies, and, quite frankly, I would not advise anyone to go into teaching now. I believe the only way to bring stability back to our education system is for the parents to stand up for public education, loudly and strongly! Give the government the message that those who are entrusted with educating our precious children should be well-paid and respected! When you spend 5 years in University preparing for this profession, you should have a level of expertise that is worth respecting with a decent salary! Thanks for allowing my rant! If you want to know more about why this gets me so worked up, email me. But this is also the time of year when parents look for ways to thank the teachers who have worked with their children all year, so I want to post a thank you card for a teacher. For a teacher's card... the Faux Chalkboard Technique seems a natural! 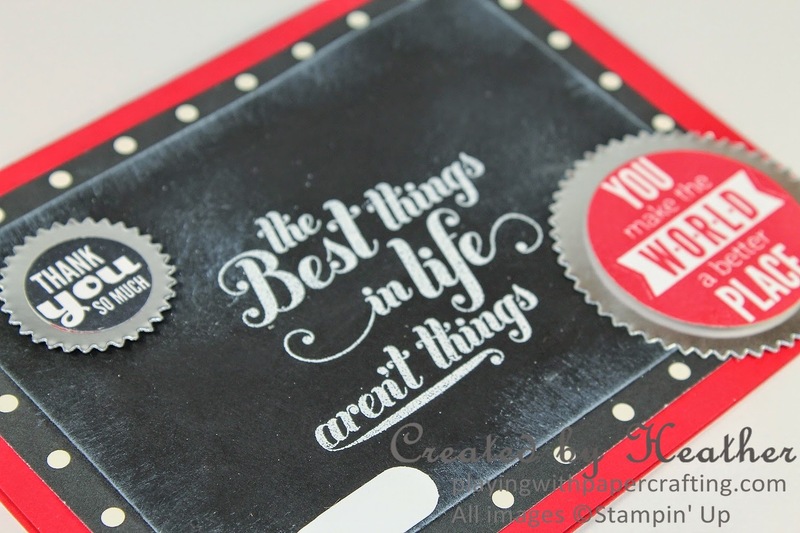 You heat emboss your image or sentiment with White Stampin' Emboss powder on a dark background cardstock, Basic Black in this case, then use some Whisper White Craft Ink and a Stamping Sponge to add the "chalk dust around the edges and in patches around the embossed part. I used the Word Window punch twice to create the piece of chalk. First you punch the Word Window shape from Whisper White cardstock, then reinsert the punched shape through the side of the punch and punch again to get the smaller piece. The main sentiment is from the Feel Goods Stamp set. All the sayings in that set I just love! And it isn't retiring so you will still be able to order it after June 4th. 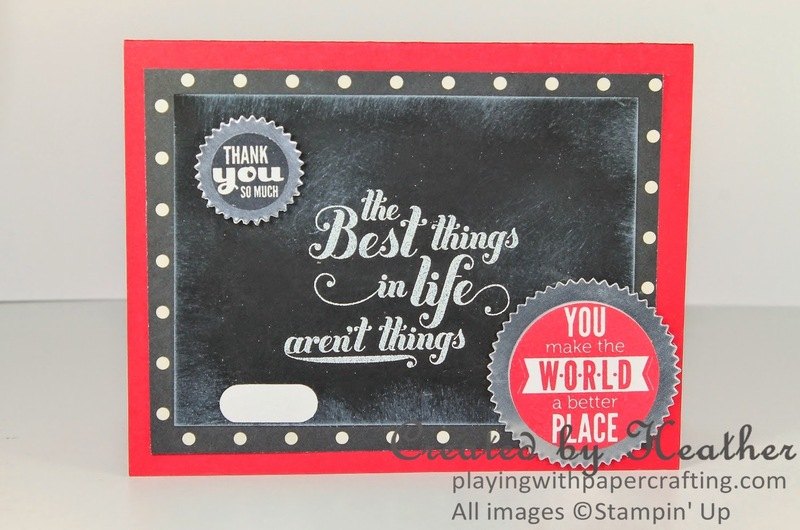 Starburst Sayings Stamp set from the Occasions catalogue provides the other two sentiments, and it will be available in the new catalogue as well. I die cut the starburst shapes behind them with the Starburst Framelits, which you can still bundle with the stamp set and save 15%. The card base is Real Red cardstock and I used a panel of Modern Medley DSP behind the "chalkboard"! So, hug a teacher today, or even better, write a letter of support to the government on his or her behalf! New Catalogue Product Shares are Now Posted! I have organized the new product shares from the 2014/15 Annual Catalogue. Check them out here and decide what you want. This is an affordable way to get a variety of paper, ribbon and embellishments without paying for a full spool or package. Four or five people share an order and divide up a spool or package between them. I will post the whole share on my blog tomorrow! 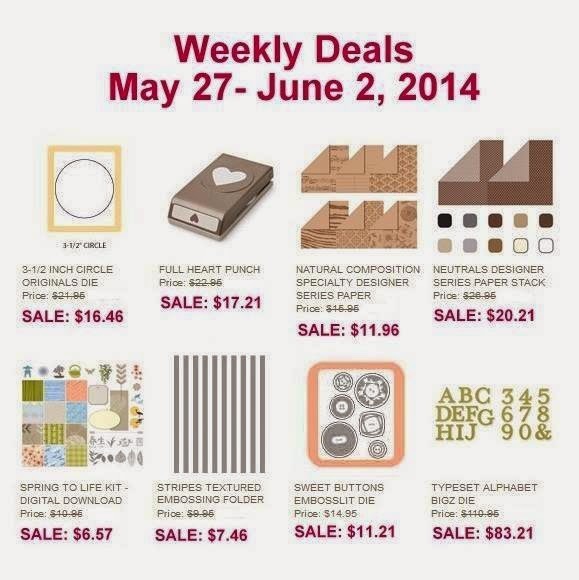 Here are the latest weekly deals for May 27 - June2.